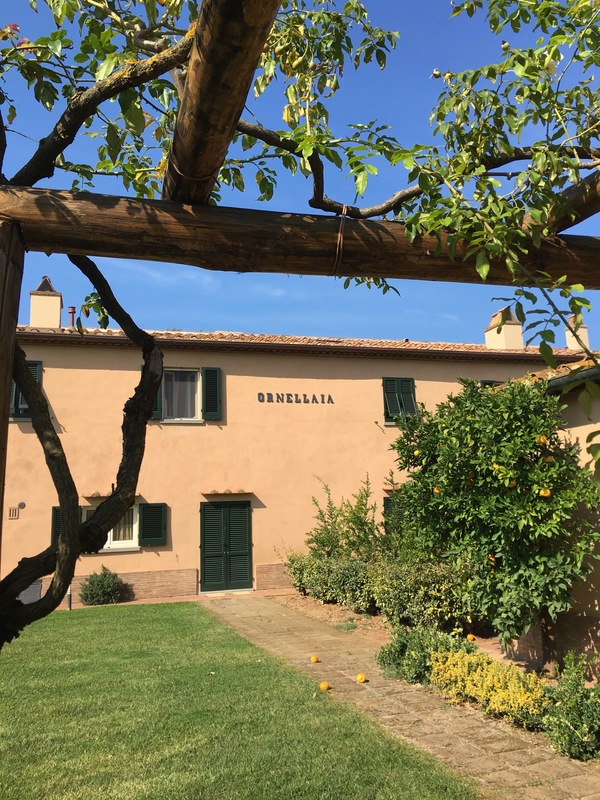 From the day the London based wine merchant Armit Wines and the world famous Tenuta dell’Ornellaia had announced a competition earlier this year to win a trip to Tuscany to visit the Ornellaia estate, I was on a mission. The challenge was to take a creative photo of one’s enjoying Le Volte (the entry level wine of Ornellaia) and to share it on social media with the hashtag #LoveLeVolte. Fast forward to the end of September and I was on the flight to Pisa with my other half, full of excitement, despite the 5:45 am wake-up. 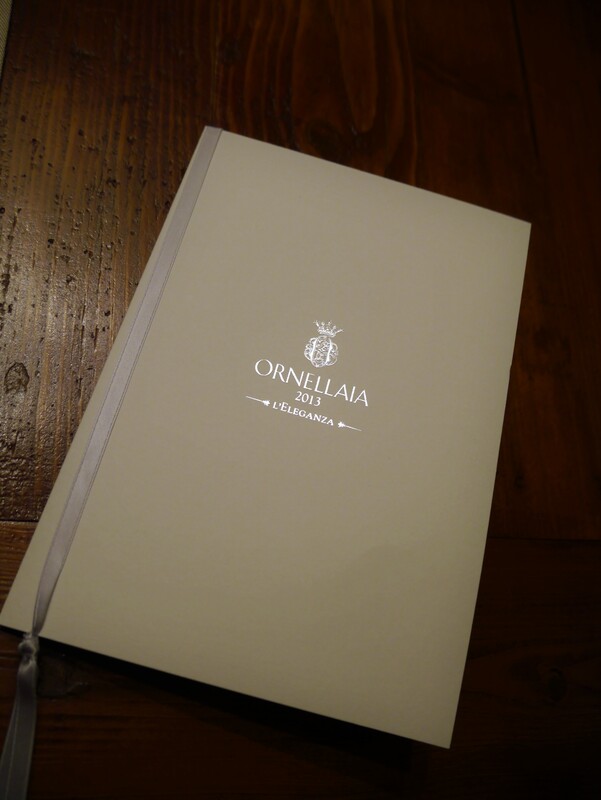 Upon arrival and in just under an hour car drive from Pisa, we reached the Ornellaia estate. I felt like a Michael Jackson fan approaching Neverland – I remember taking photos of the gate, driveway, reception in the fever of excitement and posting it on Instagram as if the world was eagerly awaiting these shots and no second could be wasted. 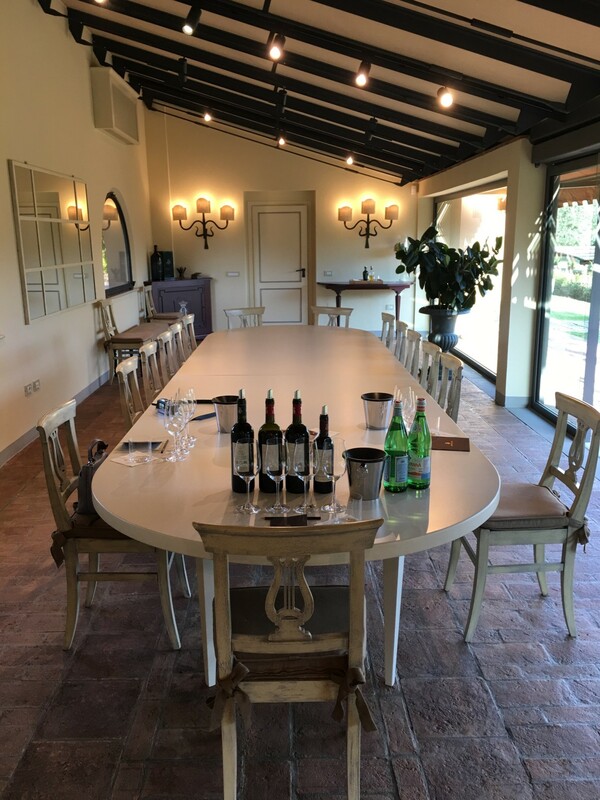 We were warmly welcomed by the staff and shown to our room where we had time to relax and refresh before our tour of the estate and tasting. 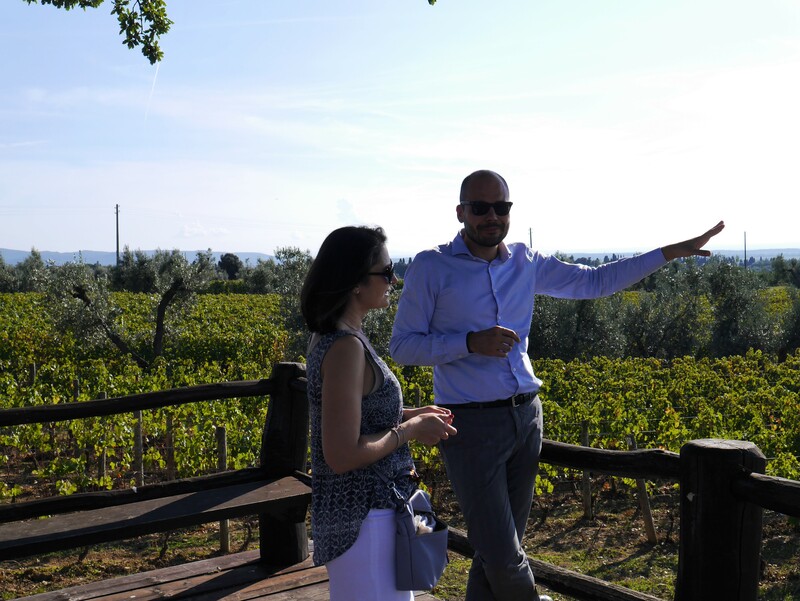 Our tour of the Ornellaia estate started at the breathtaking Bellaria vineyard with the Tyrrhenian Sea as the backdrop on the horizon. 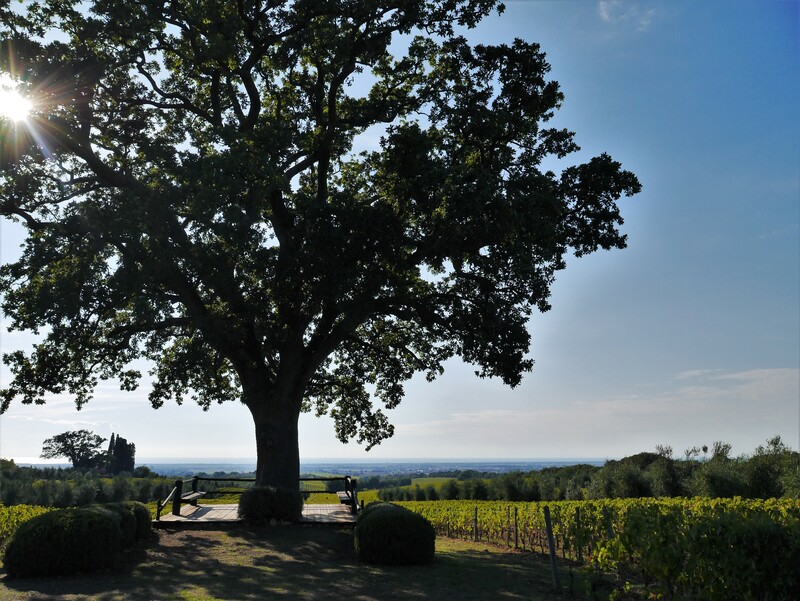 Matteo, who looked after us throughout our stay and was our guide, was very kind to share some history of the estate while we enjoyed the view of Bellaria from the observation point hiding in the shade of the century-old oak tree. 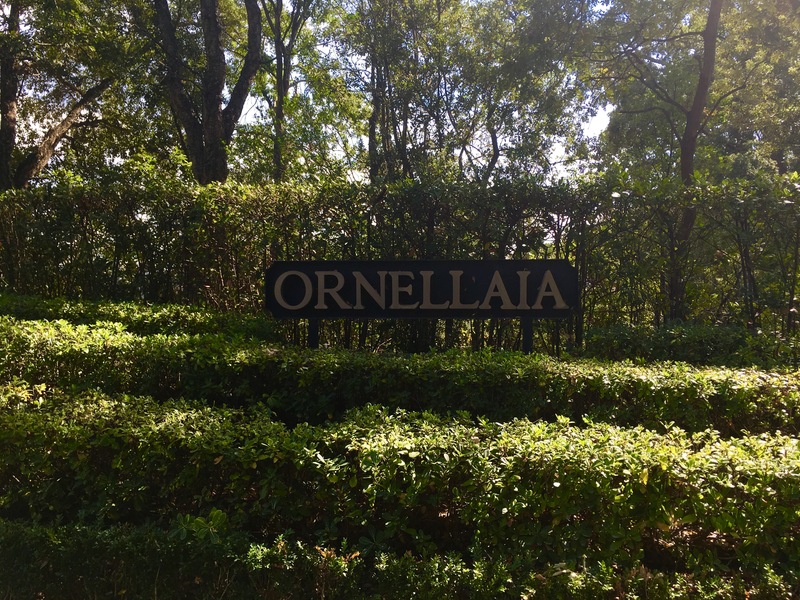 Ornellaia was founded by Marquis Lodovico Antinori in 1981 and the first vineyards were planted the year after. 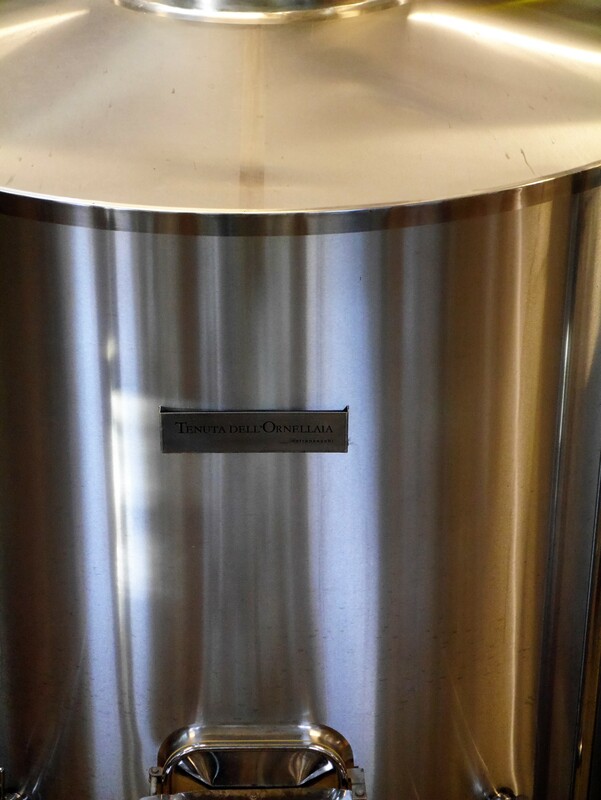 As it takes about three years after planting for a vine to produce fruit, the new winery started its operation with the 1985 vintage. 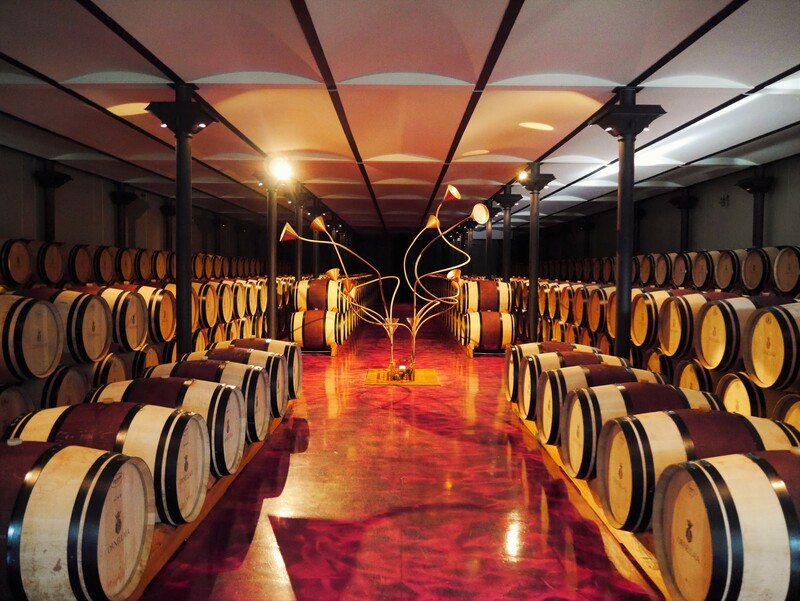 After the takeover by Robert Mondavi in 2002 and periods of shared ownership with the Frescobaldi family and Constellation Brands, Tenuta dell’Ornellaia has been fully owned by Marquis de Frescobaldi since 2005. Alex Heinz has been the head winemaker ever since. 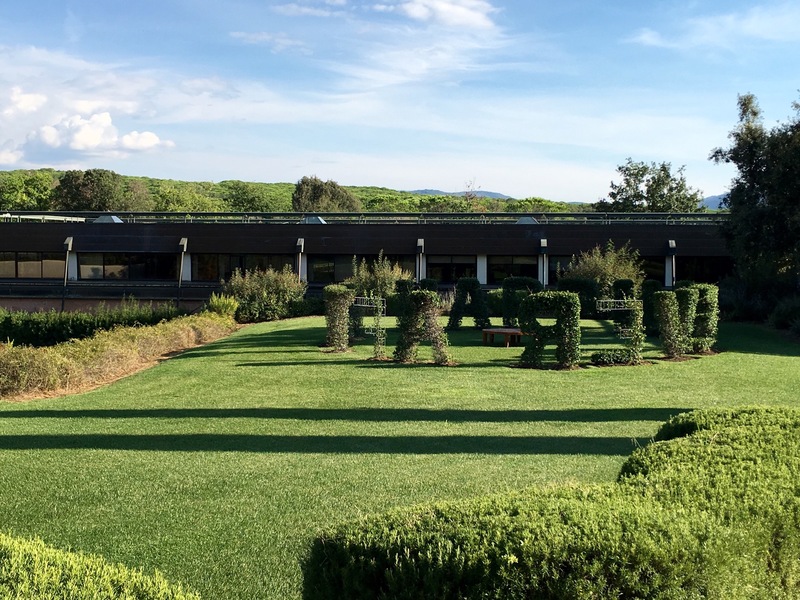 On our way back to the estate we drove past a very special vineyard – the patch of land that is home to the vines used for the epic Masseto wine. This 100% Merlot is so unique and rare that it retails at £500+ a bottle. 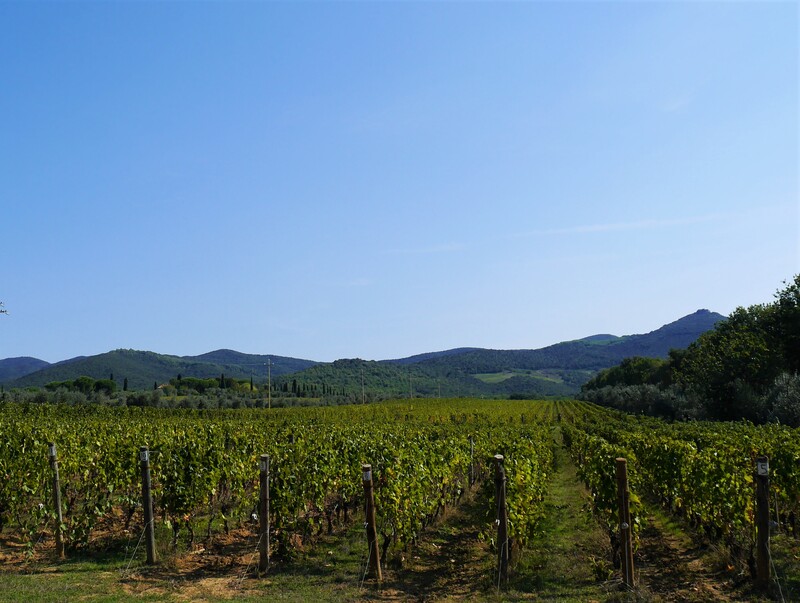 The exclusive nature of Masseto didn’t get unnoticed by some locals – I was told that just a few days before our arrival wild boars invaded the vineyard and polished away quite a lot of fruit. 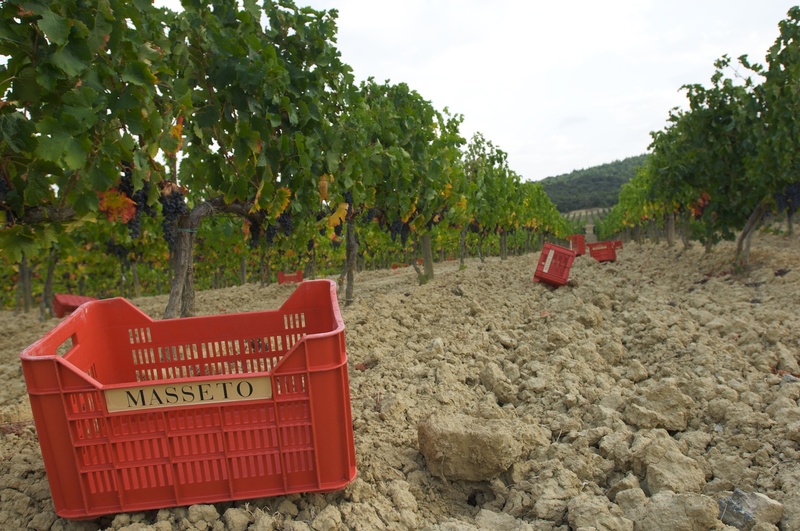 These boars had some balls, considering that the annual production of Masseto is only 32000 bottles!! 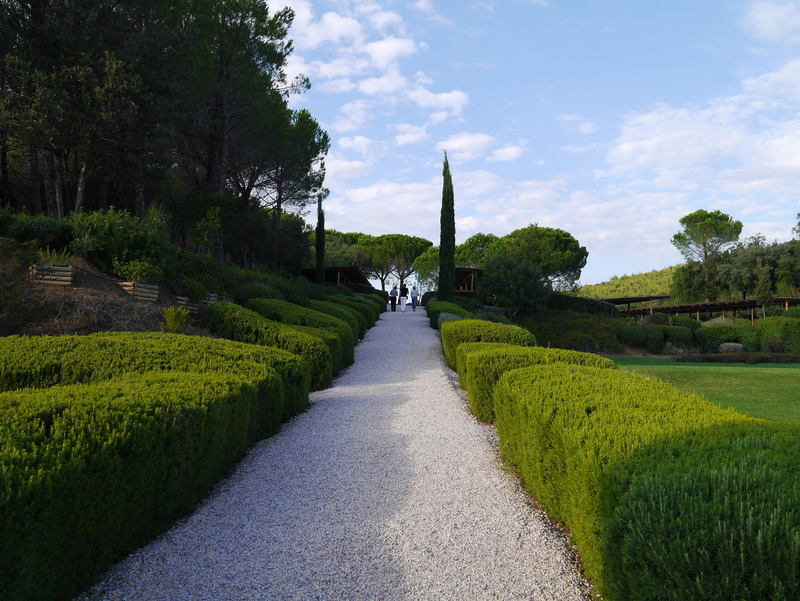 Back at the estate, walking through the perfectly manicured garden with its magnificent cypresses you can’t help but sense in the air the majestic quality of the wines crafted here. 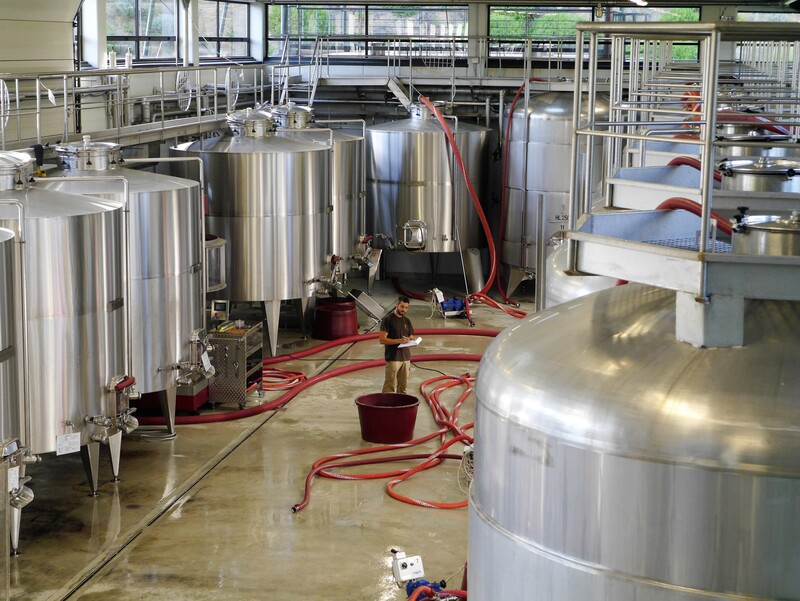 Our tour continued in the winery where people were very busy processing the freshly harvested grapes and even though there was no access to certain areas, you could catch a glimpse of the highest quality equipment used to produce these world class wines. 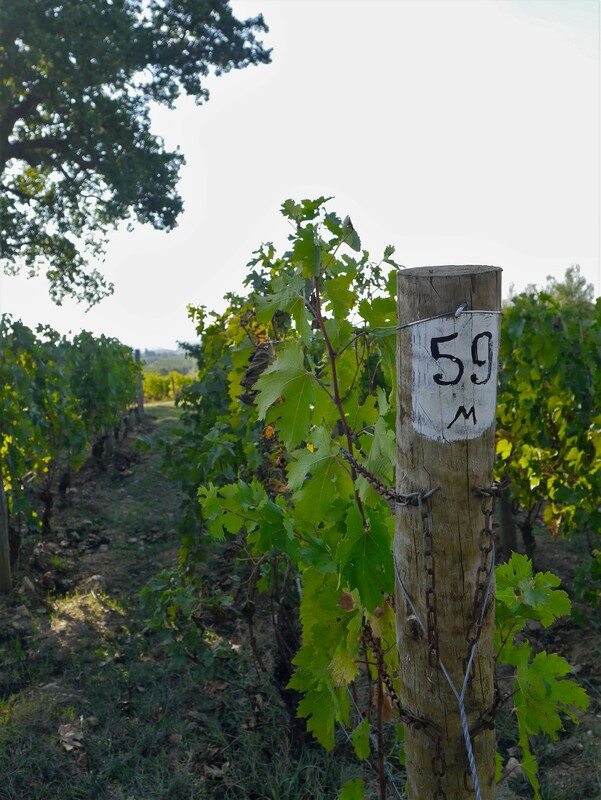 Notably, grapes from each of the over 60 parcels of land are vinified and aged separately. 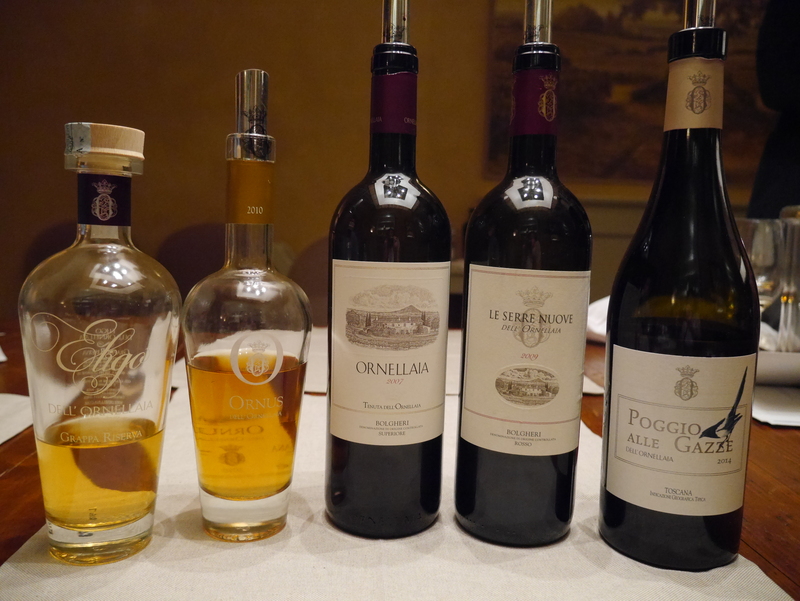 Only thereafter are they tasted and blended into the final wines by Alex Heinz – first the flagship wine Ornellaia and then the Le Serre Nuove (2nd wine), Variazione In Rosso (special blend) and Le Volte (3rd wine). 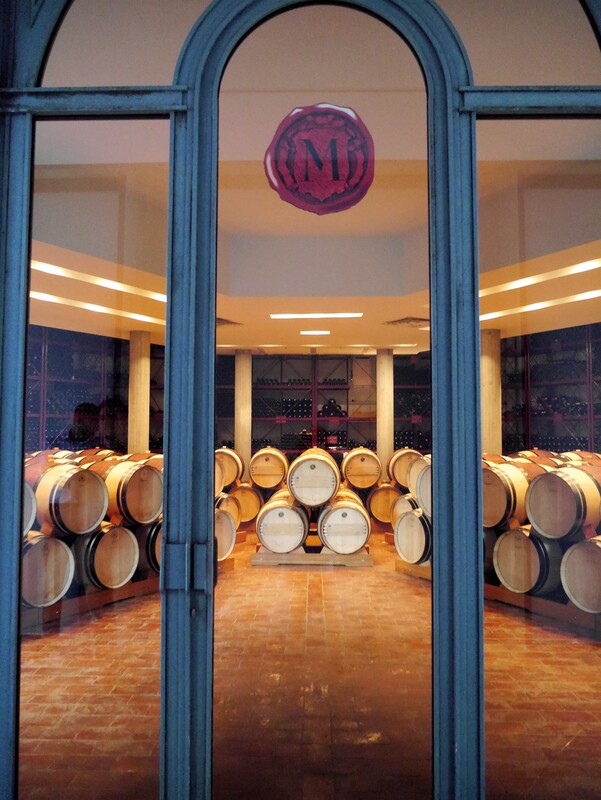 Further to the cellars, the heart of the estate, the 2014 vintage of Ornellaia and Masseto wines are peacefully ageing in French oak barriques, set beautifully in dedicated temperature and humidity controlled rooms. 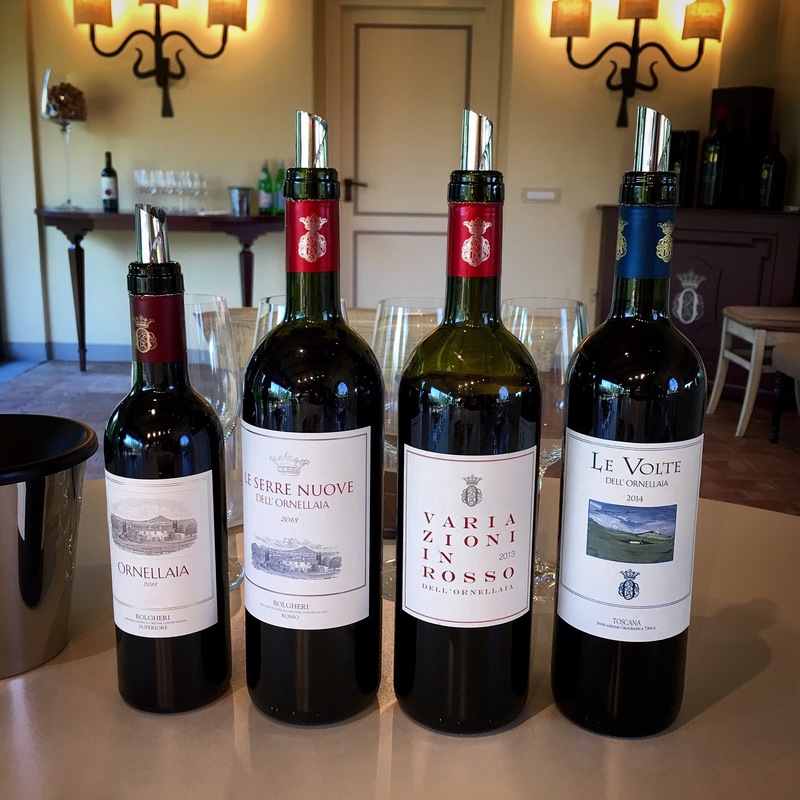 It is normally 2.5 years after the vintage that the Ornellaia and Masseto are released to the market – the 2013 wine just got released earlier this year. 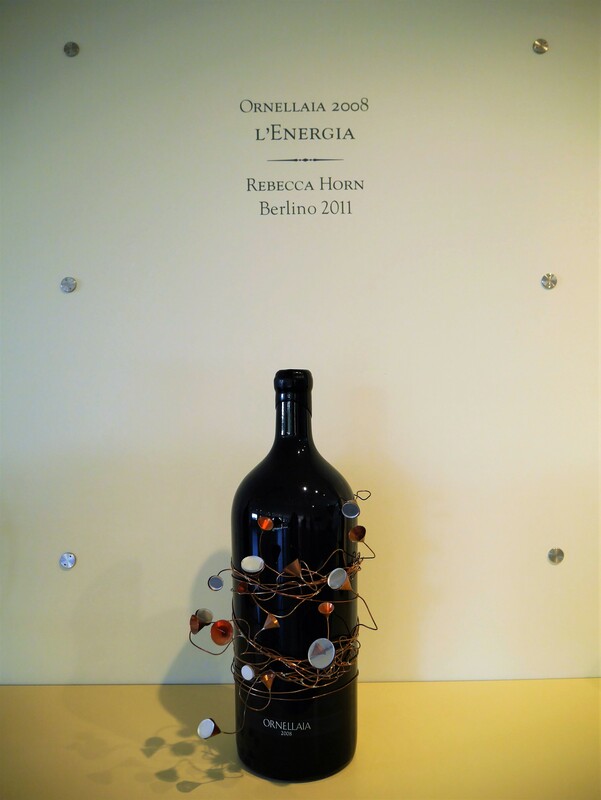 In 2009, with the release of the 2006 vintage, the estate launched the Vendemmia d’Artista (=artist’s harvest) project. Every year since the launch the winemaker defines the character of the new vintage of the flagship wine in one single word. An artist is then commissioned to express this word, the unique character of the vintage, in a piece of art. 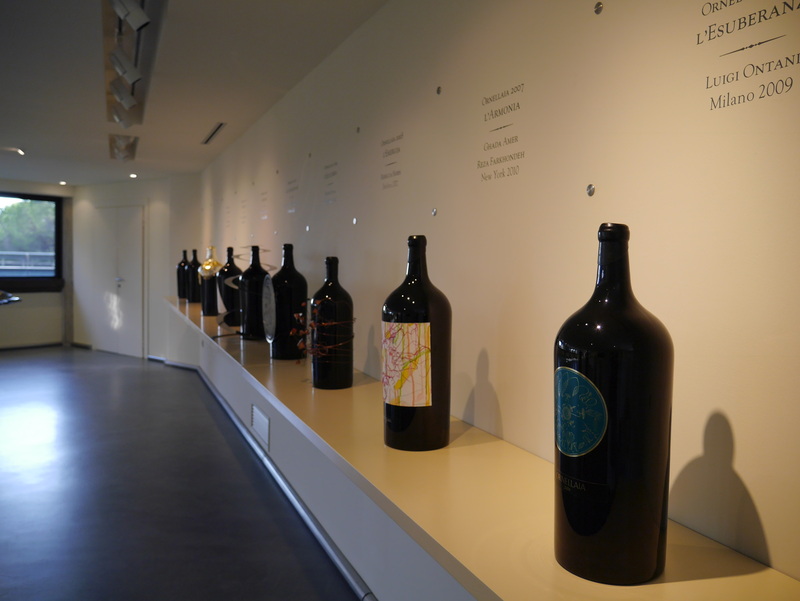 The artist’s work includes a special label for the flagship wine (only one bottle carries this label in a wooden box of six) and 111 large format bottles (3-9L) designed and signed by the artist. These bottles are highly sought after by collectors and some of the revenue from auctions goes to charities supporting the arts. 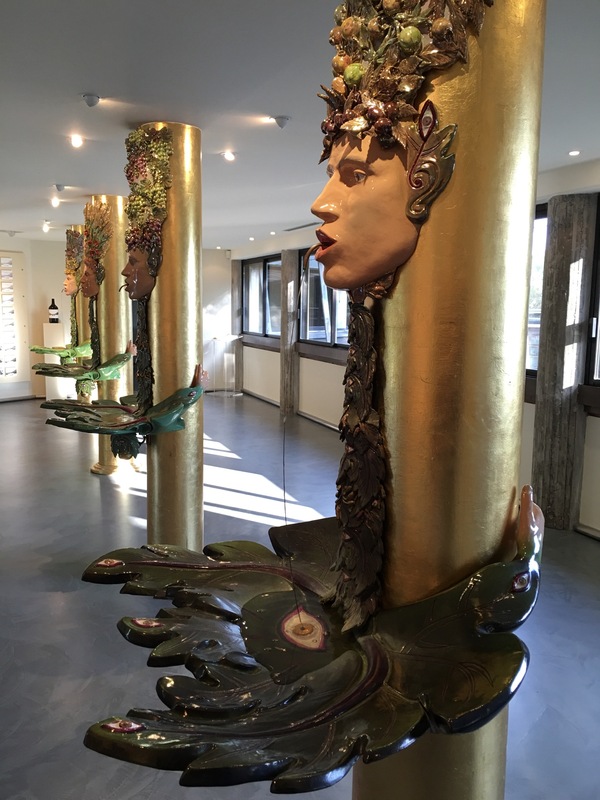 Following the tour of the winery and the “museum” room we reached the bright and airy tasting room with a floor-to-ceiling glass wall opening the views on the beautiful gardens. 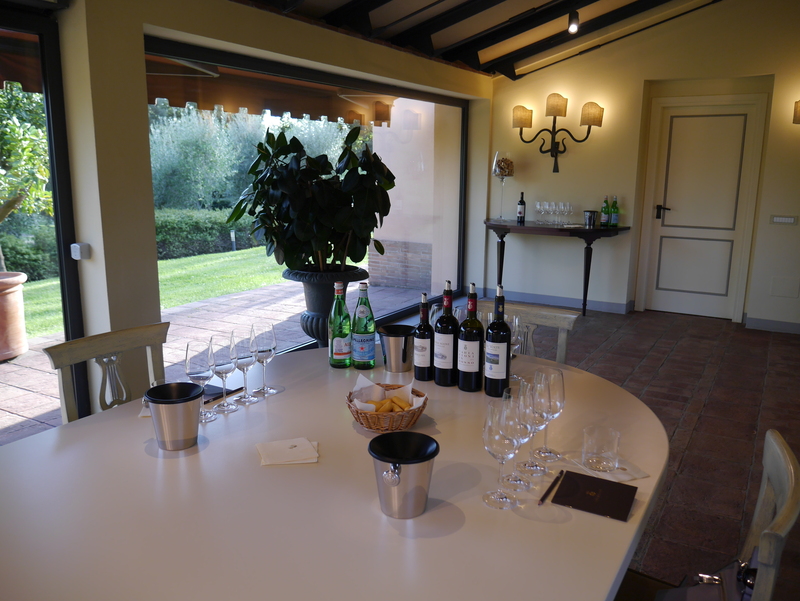 The much anticipated tasting of the estate’s wine range was about to begin. 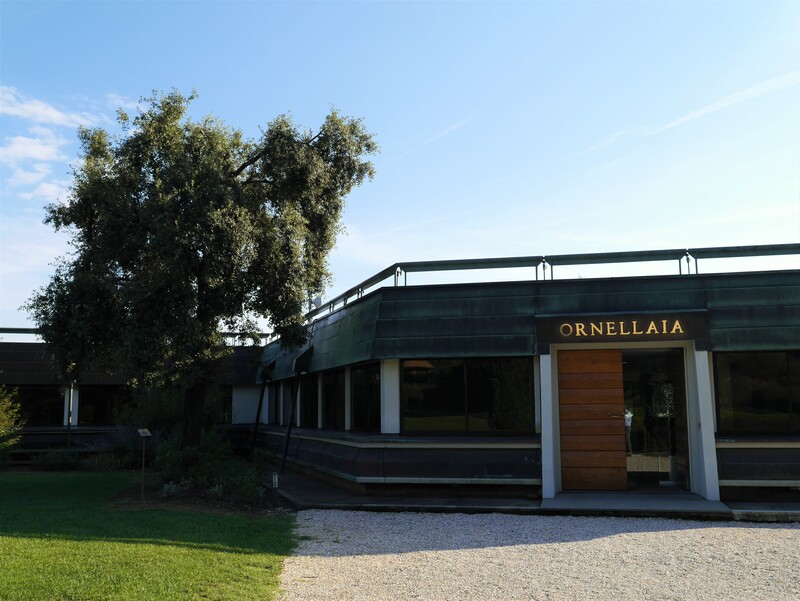 Interestingly no other wines are available for purchase at the winery, as Ornellaia prefers to allow the wine shops in the area to be the main retail channel in recognition of the key role they played historically in establishing the commercial success of the wines. THE EVENING… An unforgettable part of my experience was the dinner at the estate. 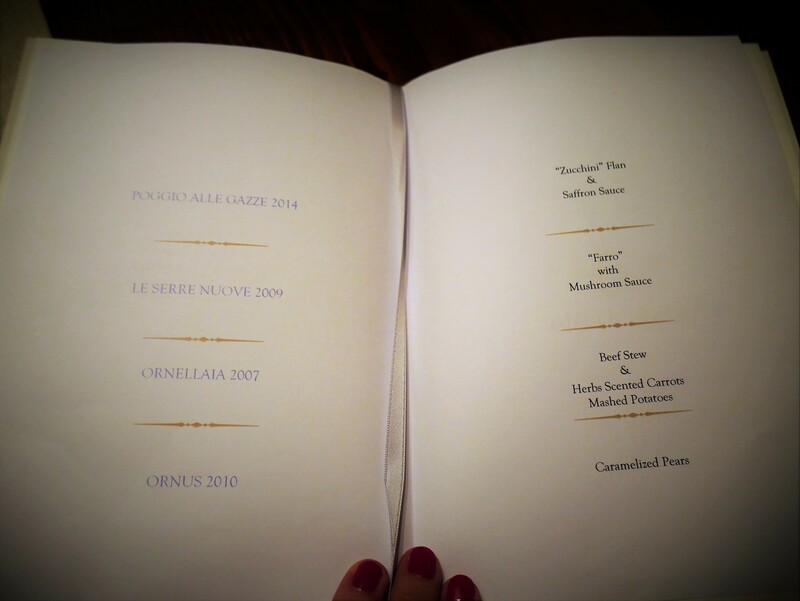 A personalized brochure containing the menu and the wines paired with each dish was expecting us at the beautifully set table. … and the Portuguese family who for many years have been working at the estate and running its kitchen dished out an exceptional four course meal for us. 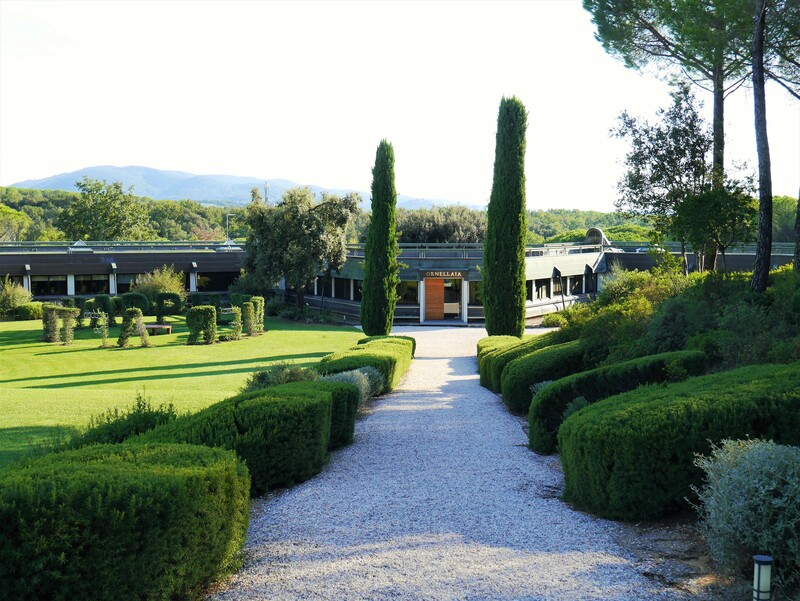 I remember very well the moment I tasted the 2007 Ornellaia: Maurice Ravel’s “Bolero” started playing in my head. I am not sure what triggered this association in me and I struggle trying to put it into words. I just know that it was a fascinating moment. 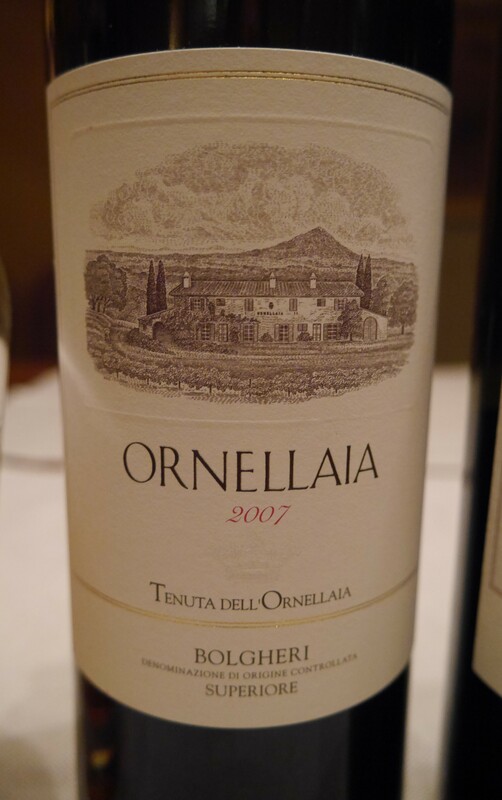 I guess, if Ravel’s “Bolero” was a wine, it would probably be 2007 Ornellaia, L’Armonia – gentle and smooth, yet incredibly powerful at the same time. 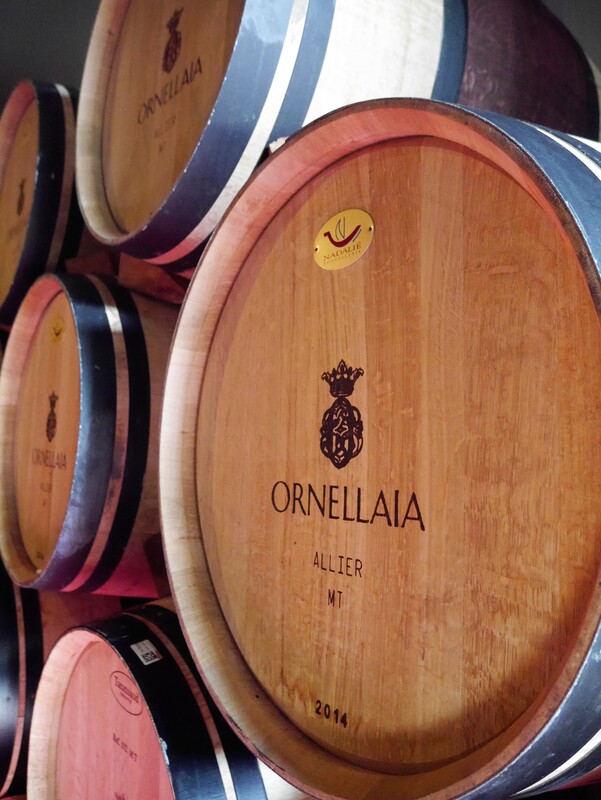 I would like to thank Matteo and the hospitality team at Ornellaia for arranging this wonderful trip for us, for looking after us, making us feel so welcome, bringing across the spirit of these magnificent wines and for all the recommendations on what to do and explore in the region. This was an unforgettable journey. Nelson and Emilia, muito obrigado for treating us with your exceptional food. Also huge thank you to Armit Wines for launching the competition and giving me a chance to win this trip in the first place. 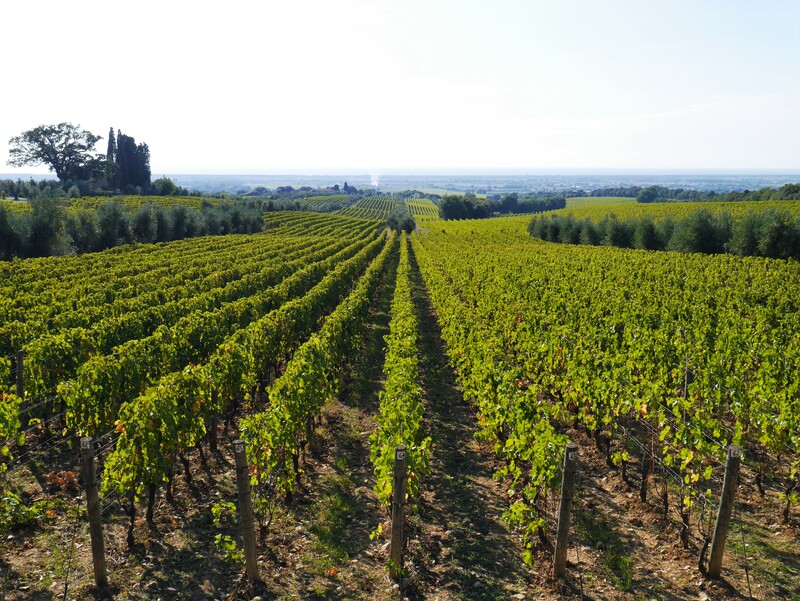 Make sure you don’t miss out on my FULL TRAVEL REPORT which includes some history of Bolgheri as a wine region, visits to two other wineries and plenty of recommendations for restaurants and places to visit nearby.